* Adapted from the shounen manga by Oh Great!, serialised in Weekly Shounen Magazine. Microtechnology has created self-powered roller blades that allow a rider to rip along at blistering speeds, roar up walls and fly to incredible heights. And now Air Trecks (AT) has become the new rage with all of the gangs. Ikki got the dickens kicked out of him by a roller-blade gang and the four sisters that he is staying with are not going to allow him to forget it. Of the four sisters, it falls upon fourteen-year-old Ringo to be responsible for looking after their trouble-some adopted little brother whom they have nicknamed baby-face. 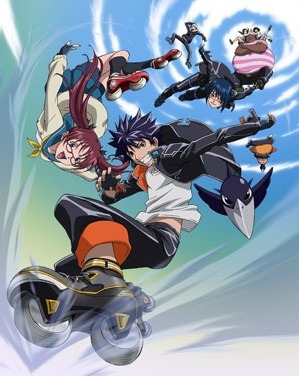 When Ikki finds out that the girls are part of an elite AT gang called the Sleeping Forest, he borrows one of their skates and rides off into the night vowing to learn to ride. A chance encounter introduces him to a cute roller-blade girl. Ikki follows her to a Stormrider (AT gang) gathering and learns that she is called Simca. Simca really seems to take a fancy for him (or perhaps she really enjoys teasing him), but when his sisters (most specifically Ringo) find out, they are not happy with Ikki's new friend.